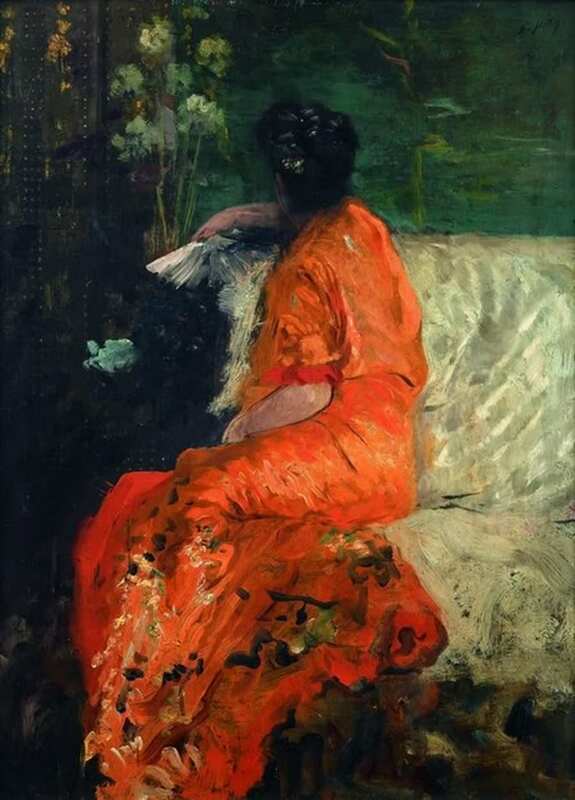 Giuseppe De Nittis (1846–1884), The Orange Kimono (c 1878), oil on canvas, 42 x 31 cm, Private collection. Athenaeum. When researching my recent series on ‘vanished’ Impressionists, I stumbled across one painter whose work was shown at the First Impressionist Exhibition in 1874, who showed great talent (if not genius), technical ability, and artistic innovation, but who is today almost forgotten: the Italian Giuseppe De Nittis (1846-1884). My previous article showed examples of many paintings which are attributed to him, with suggested dates of their completion. Inevitably many are from single sources, whose authenticity is impossible to confirm. Here I will limit my illustrations to works which I can locate in at least two (reasonably reliable) sources, and use dates which have been checked by at least one of those sources. He was born in Barletta, on the south-east coast of Italy. He started studies at the Istituto di Belle Arti in Naples in 1861, but soon was strongly attracted to the new realist painting style. 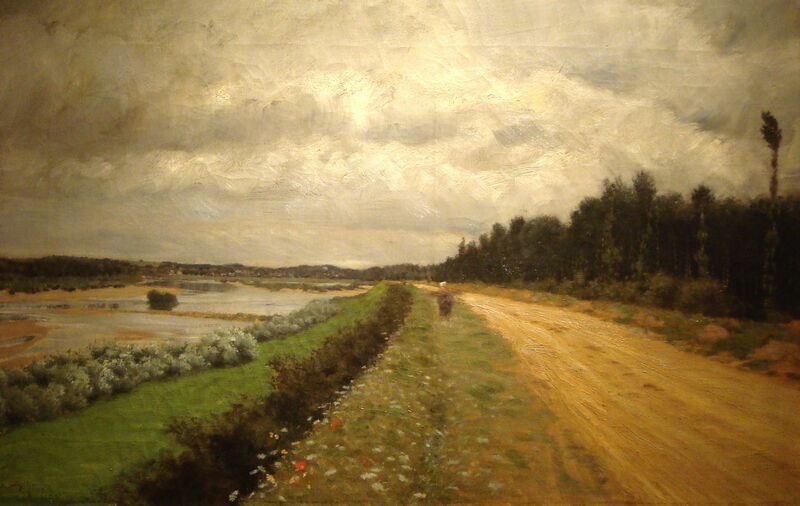 In March 1863, he was given two months leave of absence to go and paint in the countryside. However he was expelled from the Institute in June for disciplinary reasons. He returned to painting realist landscapes, developing his technique and skills, together with Adriano Cecioni (1836-1886) and other artists who formed the Scuola di Resina (the School of Resin). His first painting was shown in an exhibition in Naples in 1866. Initially, he painted in a realist style, but showed signs of increasingly painterly facture during the late 1860s. In 1867, with further success exhibiting in Naples, De Nittis moved to Paris, and Cecioni to Florence. De Nittis met and got to know de Goncourt, Zola, Guy de Maupassant, Manet, Degas, Tissot, Gustave Doré, and his compatriots Telemaco Signorini, Serafino De Tivoli, Giovanni Boldini, and Diego Martelli, of the Macchiaioli. He also became known by the French version of his first name, Joseph. In 1868, he won a contract to supply the Paris dealer Goupil with genre works, and on the strength of his improving income, he was able to marry Léontine Gruville the following year. Also in 1869, he had two paintings accepted for the Salon. However next year the Franco-Prussian War drove him to return to Italy, until he could resume his career in Paris in 1871. In 1872, he received critical success with a painting of his shown in the Salon, and went back to Italy to paint Vesuvius erupting for Goupil. Seven small paintings on wood remain from the studies he made of the area around Vesuvius in 1871-2, and they are very painterly, in a style intermediate between the earlier small plein air landscapes of the Macchiaioli, and contemporary plein air paintings on canvas of the Impressionists. In 1872 he also painted some larger works on canvas which were presumably destined for Goupil. 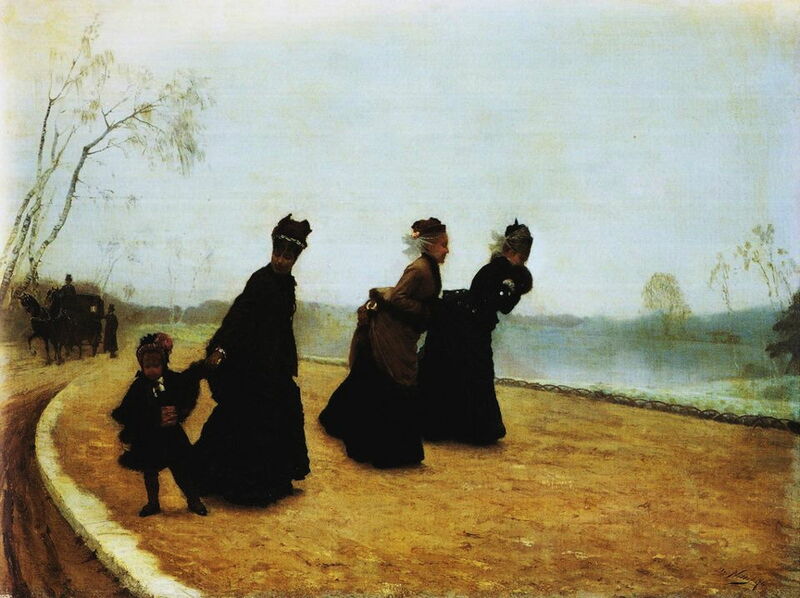 Giuseppe De Nittis (1846–1884), Che Freddo! (Freezing!) (1874), oil on canvas, 55 x 74 cm, Private collection. Athenaeum. He had two paintings shown in the Salon of 1874, including Che freddo! (Freezing!) (1874). Degas invited him to take part in the First Impressionist Exhibition that year, although Goupil tried to dissuade him from doing so, pointing out the terms of his contract. De Nittis was painting in London at the time of that exhibition, where wealthy patrons such as the banker Kaye Knowles enabled him to terminate his contract with Goupil. Giuseppe De Nittis (1846–1884), Country Road – the Bank of the Ofanto (c 1874-5), oil on canvas, 43 x 65 cm, Pinacoteca Giuseppe De Nittis, Barletta, Italy. By LPLT, via Wikimedia Commons. 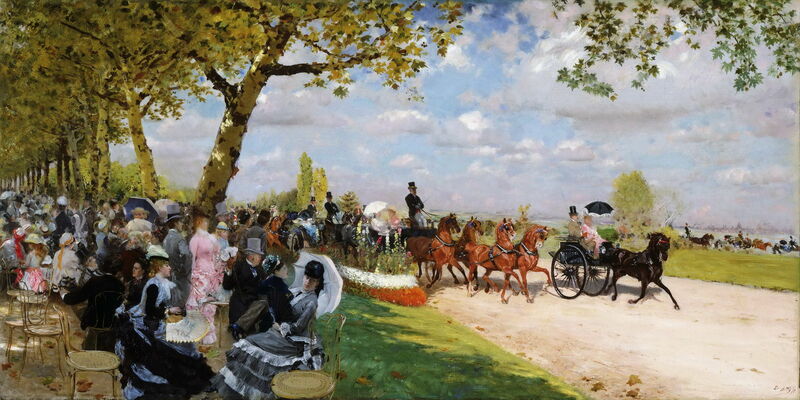 Giuseppe De Nittis (1846–1884), Return from the Races (1875), oil on canvas, 70 x 105 cm, Philadelphia Museum of Art, Philadelphia, PA. Athenaeum. He exhibited successfully again in the Salon in 1875, 1876 (when he was particularly productive in London), 1877, and 1879. During this period, he remained quite tightly realist in those works destined for the Salon, but most of his other paintings show abundant free brushstrokes. He also became an enthusiast for Japonisme, which was starting to get popular among the Impressionists and others in the avant garde. 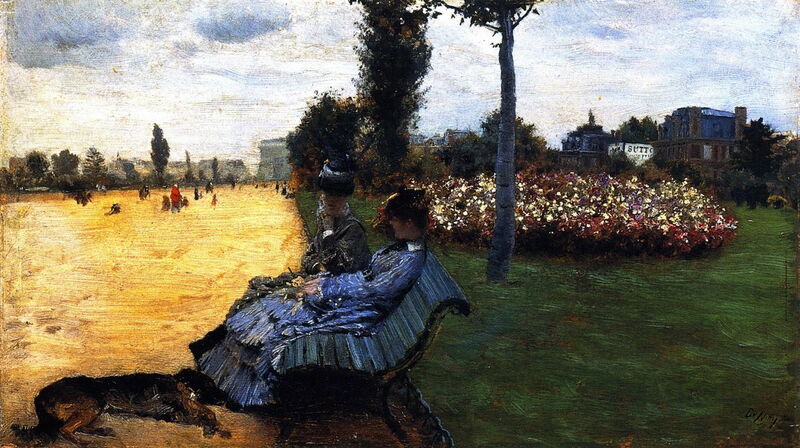 Giuseppe De Nittis (1846–1884), On the Bench of the Champs Elysées (c 1878), oil on panel, 18 x 31 cm, Private collection. Athenaeum. 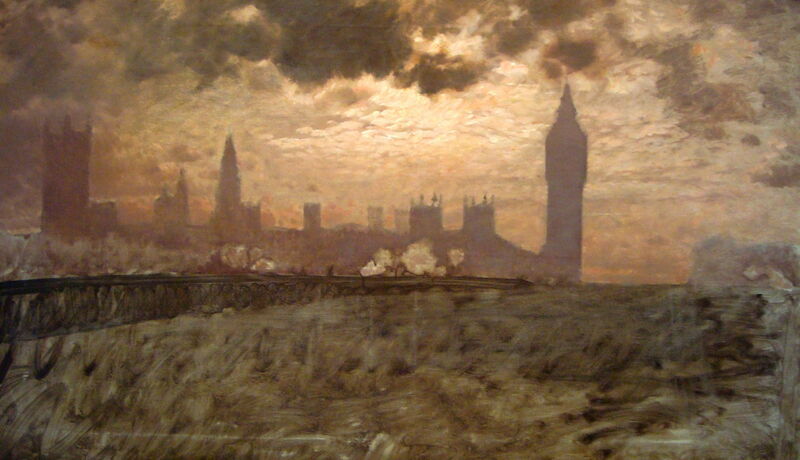 His painting campaign in London in 1878 was particularly successful, with several works selling for good prices, and still to be found in various collections. 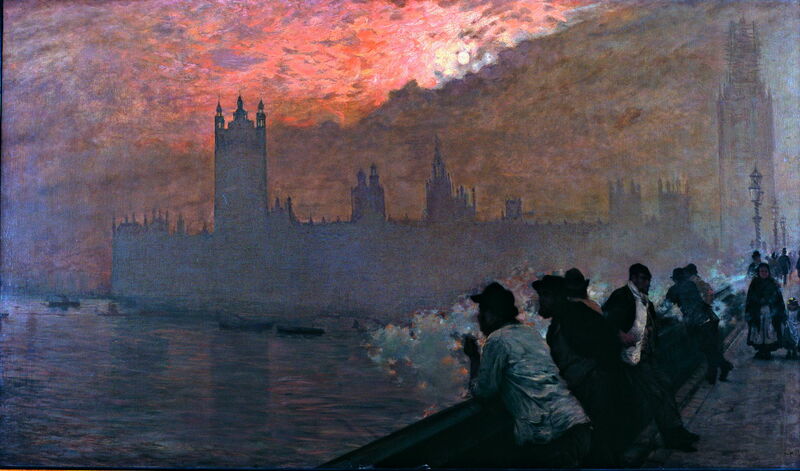 Giuseppe De Nittis (1846–1884), Westminster (1878), oil on canvas, 110 x 195 cm, Private collection. Athenaeum. Giuseppe De Nittis (1846–1884), Westminster Bridge (1878), oil on canvas, 80 x 134 cm, Pinacoteca De Nittis, Barletta, Italy. By LPLT, via Wikimedia Commons. In 1878 he showed no less than twelve paintings at the Paris Universal Exposition. He and his wife entertained many writers and artists, including Degas, Manet, Caillebotte, and de Goncourt, and in 1878 he was awarded the medal of the Legion of Honour. The following year he started to use pastels more extensively in his work. In the next article, I will continue his biography and paintings from 1880. Posted in General, Painting and tagged de Nittis, Degas, Goupil, Impressionism, Italy, Macchiaioli, painting. Bookmark the permalink.